This is one of the most important things that fiber optic technician training has taught us – fiber optic cable is literally made of glass. True! Also, the cable can be pretty delicate. 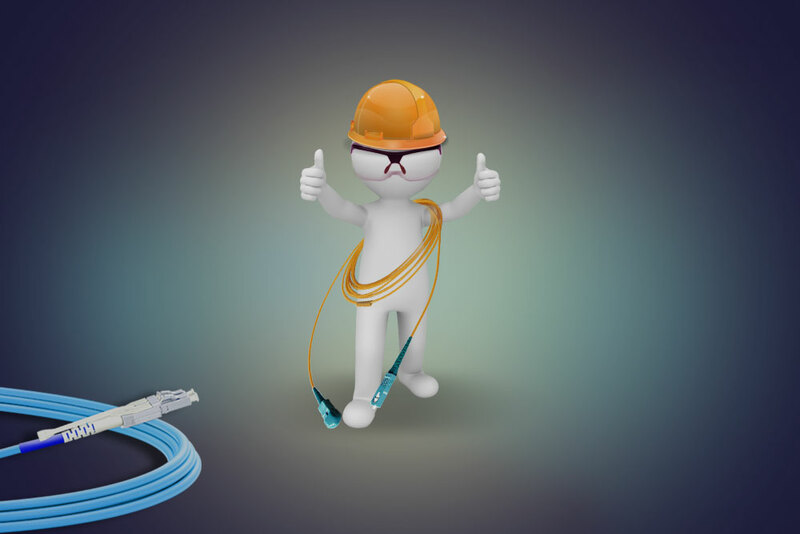 So, here are handling tips for fiber cables that will help you keep your cables in good working order. The “bend radius” of a cable is the term for how sharply a cable can safely bend at any given point. All types of cable have a bend radius, and this radius can be unique to each type and make. Let me help simplify these things for you. I’m going to give you a rule of thumb when it comes to bending cables. So, here’s the rule: You don’t want a fiber cable to bend at any given point with a radius less then 10 times the diameter of the cable. For a normal fiber patch cable, this is no sharper than if it were bending around a tennis ball. The glass in the cable could break or shatter causing reflection and refraction of the light running through the cable; i.e., the cable starts to go really bad – and its splinters may hurt people. When a fiber cable bends too sharply the light passing through the cable will reflect too steeply and not make the turn. Because the light bounces off the walls of the fiber whenever the fiber bends it can’t bend too steeply. If it does, the light will reflect at too steep an angle and will be absorbed by the cable or make a U-turn and head back from where it came from. Fiber optic cables aren’t cheap and the tips on the connector can easily get damaged, smudged, etc. So put a cap on them at all times. Because light goes through these cables, minor things can cause big issues for you. Things like touching the tip of the fiber cable with your finger or letting dust settle on the tip can potentially cause problems. Dust, finger smudges, etc. will all cause the light leaving that patch cable to reflect and refract causing loss and making the cable less efficient or un-usable. When you secure a fiber cable to another cable, cable tray, etc. make sure you don’t tighten the zip-tie, or Velcro too much. Over-tightening the securing straps apply pressure to the cable that may cause the glass inside the cable to warp or break, and make it more prone to failure sooner or later. When you install fiber cable or deal with extra slack from the cable, keep the cable from running off sharp angled edges like that of a table or shelf. The reason for this is the glass may warp or break over time due to the pressure on the cable at the sharp edge. Do you know that the weight of the cable being pressed against such a small point is enough to break or warp the glass inside to a point where it will cause light loss or outright failure? To cap it all up, when handling fiber optic cable: don’t bend it to tightly, don’t squeeze it, keep the ends covered all the time, and don’t poke it too much.